The Columbia River Gorge National Scenic Area features dozens of waterfalls along with stunning river views and hiking trails. On this 8-hour day trip from Portland, an informative guide takes you through the region’s spectacular landscapes, including viewpoints of the gorge from the Portland Women’s Forum State Scenic Viewpoint and the Vista House at Crown Point. Then fill your camera with shots of five waterfalls: Latourell, Bridal Veil, Wahkeena, Horsetail and, of course, Multnomah Falls. Round-trip transport from downtown hotels included. Meet your guide at your downtown hotel for the drive to the Columbia River Gorge National Scenic Area, located approximately 30 miles (48 km) east of Portland. Your first stop is the Portland Women’s Forum State Scenic Viewpoint for your first view of the Columbia River Gorge. Then visit the nearby Vista House at Crown Point, possibly the best known of all the scenic lookouts along the Historic Columbia River Highway with its vantage point 733 feet (223 meters) above the Columbia River. Admire the panoramic view from the 1916 observatory, refurbished in 2005 with a remodeled marble interior. The former comfort station for travelers now serves as a memorial to Oregon pioneers. Next, it’s on to the waterfalls! First stop: Latourell Falls, which plunges 249 feet (76 meters) over a wall of columnar basalt before cascading toward the Columbia River. 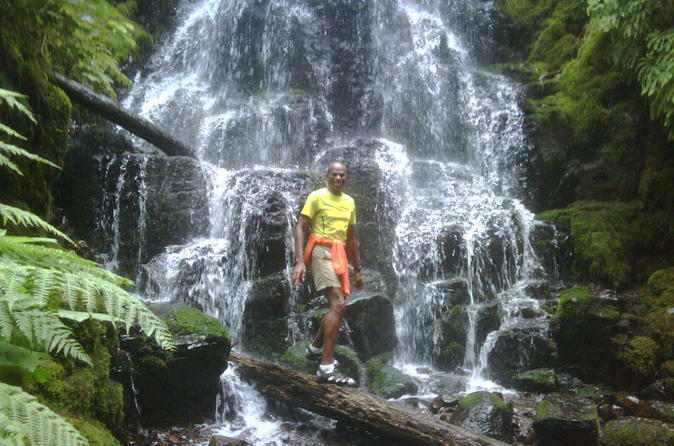 If you’d like, go with your guide on an optional 2-mile (3.2-km) hike that leads to the base of the falls. Back in your tour vehicle, cross a bridge over Bridal Veil Falls, and then follow a winding footpath leading to a viewing platform where this hidden gem can be seen. An optional 1-mile (1.6-km) guided hike brings you closer to the water that cascades down angling rock faces. A bit further down the highway, Wahkeena Falls tumbles 242 feet (73 meters) into Wahkeena Creek, surrounded by tall, moss-covered firs. Continue to nearby Multnomah Falls, one of the Seven Wonders of Oregon and the second-highest year-round waterfall in the US at 620 feet (189 meters). Nearly two million visitors per year come to see its plummeting two-tier cascade from the Benson Bridge, built in 1914. The last waterfall on your tour is the 176-foot (53-meter) Horsetail Falls, nestled within a mossy slope of ferns. Following this final view, visit the Bonneville Lock and Dam, built during the Great Depression as the river's first hydroelectric dam. Depending on the season, you may see steelhead trout or chinook, sockeye or coho salmon swimming up a fish ladder. Then head to the town of Cascade Locks for lunch (own expense). After lunch, cross over the Bridge of the Gods to the Washington side of the Columbia River, and view traditional fishing platforms of local American Indian tribes. Wrap up your full-day tour at the Columbia Gorge Interpretive Center Museum, which showcases biographies and natural history, with special exhibits on the Lewis and Clark expedition, the timber and fishing industries, and the First Peoples of the Gorge, the Cascade Chinook. In the evening, you’re returned to your hotel in Portland.